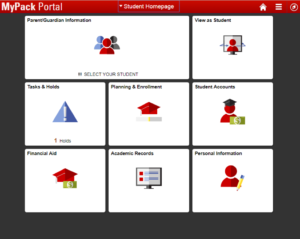 Parents/guardians that have been granted access to their student's information can use the guide below to help navigate throughout MyPack Portal. Planning/Enrollment: View your student’s current and upcoming class schedules. Student Accounts: View your student’s billing history, 1098T information, current charges and make a payment online. Financial Aid: View your student’s financial aid information, including: awards, loans, scholarships, fellowships and work study jobs that have been received or have been offered. Also, see if your student has applied for Financial Aid and the status of our student’s application. Academic Records: View your student’s grades for a selected term, find out their class rank, see a full listing of their course history including transferred courses, and/or order a copy of your student’s transcript.